Drum rolllllll Making a rare appearance, the star of tonight’s dish is ultra nutritious, super tasty buckwheat! Buckwheat is actually a seed related to rhubarb and quite apart from its delicious, nutty flavour it is absolutely chock full of nutrition. Slow-burning to keep your energy levels constant, it also contains magnesium which can help lower blood pressure and aid delivery of nutrients around the body. If you like to spice things up then use all of the chilli! Pre-heat your oven to 220 degrees. Remove the core from the pepper and chop into bite-sized chunks. 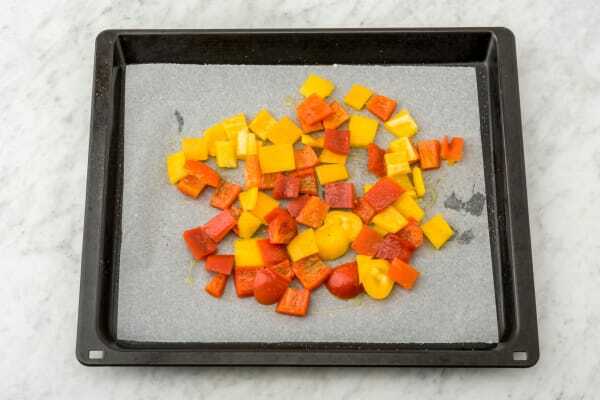 Toss the pepper in a splash of olive oil, place on a baking tray and cook on the top shelf of your oven for 15 mins.Tip:The peppers are ready when slightly crispy at the edges - keep an eye on them. In a pot, boil the water (as stated in the ingredient list) with the stock pot. Add the buckwheat. Gently boil until the buckwheat starts to come out of the water, then place a lid on the pot. Leave on the lowest heat for 10 mins before removing (don’t touch the lid until serving). 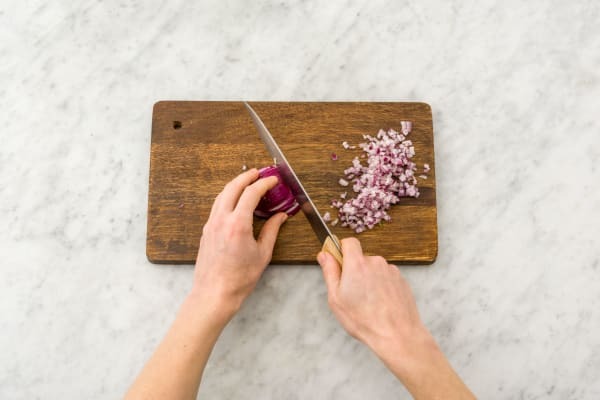 Peel and finely chop the red onion and garlic. Finely chop the chilli. Heat a splash of olive oil in a non-stick frying pan on medium heat. Once hot, add in your red onion, garlic and chilli. Tip:The chilli is a bit cheeky so add less if you don’t want too much spice. Cook for around 5 mins until soft (but not coloured). Add in the cumin, paprika and cinnamon and cook for 1 minute (if you’re not a huge fan of cinnamon, just add half!). 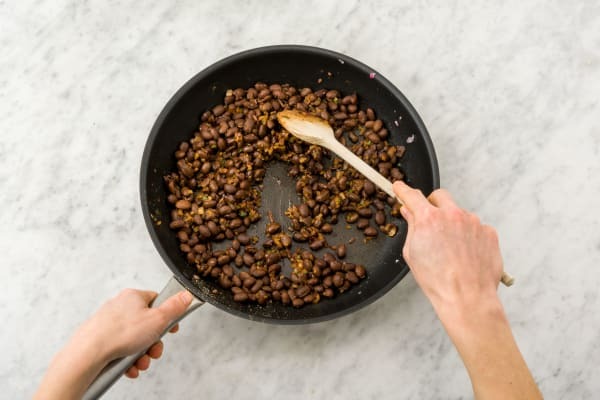 Drain and rinse the black beans before tipping into the pan. Stir together with a pinch of salt and a few grinds of black pepper. Cook for 1 minute and then remove from the heat until the buckwheat is ready. 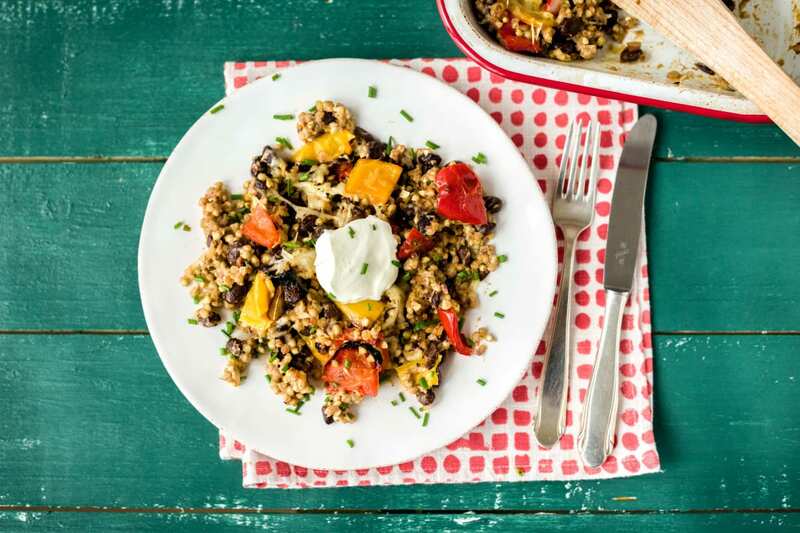 Once your buckwheat is done (it should be dry not soggy, place back on low heat if needed), fluff it up with a fork to separate the grains and then stir this into your black bean mixture, together with your roasted peppers. Now stir in half the crème fraîche, test for seasoning and add more salt if needed. 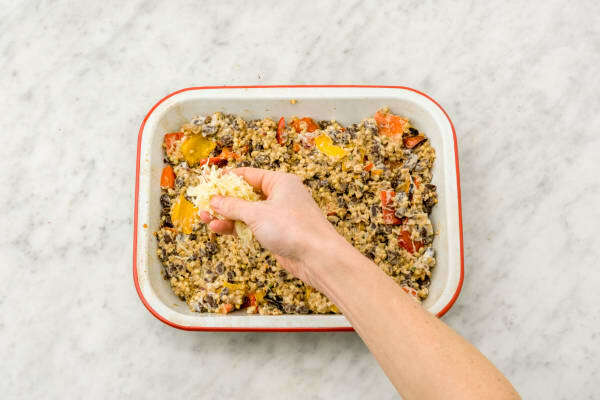 Tip the mixture into an ovenproof dish and top with the cheese. Place on the highest shelf of your oven until the top is beautifully golden and crisp. Serve with a big dollop of crème fraîche, a scattering of snipped chives (i.e. chop them up finely with scissors) and a big welcoming smile!